In order to guarantee the performance of components and systems in nuclear facilities, laboratories etc. during operation Krantz manufactures a portable leak testing device. The leakage air flow is determined following the constant pressure method, which means the housing or the test groove of the seal resp. is filled with air until the predetermined test pressure is reached. The feed in air flow which is necessary to keep the test pressure constant is equivalent to the leakage air flow. 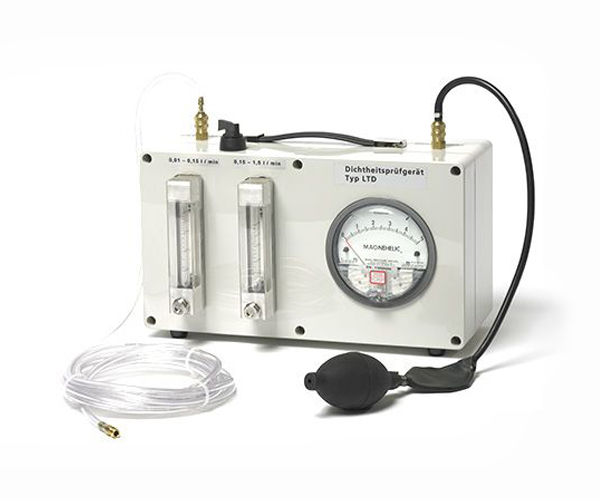 in a measuring range from 0.01 to 1.5 l/min up to a theoretical test pressure of 5 000 Pa. The measuring devices integrated in the housing will be calibrated before assembly.